This week was a bank holiday so we started in the afternoon, a few hours earlier than usual. We whipped out Ghost Stories, a cooperative game where Taoist monks are trying to save a village from being overrun by ghosts. This is a notoriously hard game and, although we were still in the game when Wu-Feng was incarnated, we didn't manage to destroy him before all our monks were killed. Even on the easiest mode this game is tough. More people showed up so a few of us played Smallworld while a couple of guys played Netrunner. Johnny was off to a good start in Smallworld but probably too good. Often an early lead can mean you're picked on by the other players. Johnny ended up coming in last with Enga finishing first. Muir was beaten twice at Netrunner but he'd only brought along a standard starter deck, hoping to teach some new recruits. His opponent had cards from the latest expansions made into a strong custom deck. Muir never stood a chance. After Netrunner they teamed up to take on the cooperative card game of Space Hulk: Death Angel, but Muir continued his losing streak and they were beaten by the game. As the evening approached a few more people turned up. Matt had appeared half way through ghost stories and was watching intensely. Sure he could beat it, he rallied the troops and started his attack while I gave Elder Sign a go. 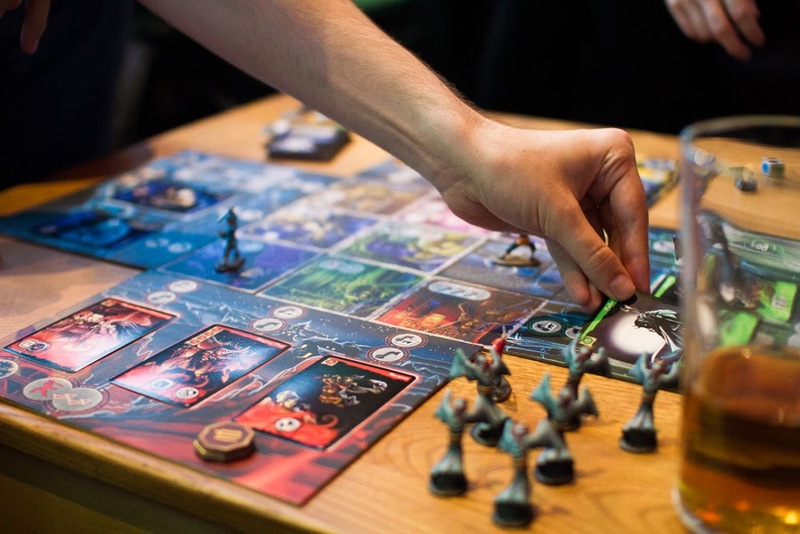 Like Ghost Stories, Elder Sign is also a dice rolling, cooperative game where players attempt to destroy monsters before an evil incarnation is summoned but unlike Ghost Stories it's set in the world of the Cthulhu mythos. You can win the game by either stopping the final incarnation from being summoned (which we were so close to doing), or by defeating it after it is summoned (which we were so close to doing). Unfortunately two nearlies still amount to a loss. Matt was over confident and also lost Ghost Stories but, ever determined, he reset the game and started again. We were not doing well against the board games tonight, being beaten every time by inanimate objects. While I played King Of Tokyo and Love Letter, Matt was calculating every move and lead his team to victory against Wu-Feng. As people headed home we finished up with one final game of King Of Tokyo, this time with Dan's Power Up expansion. 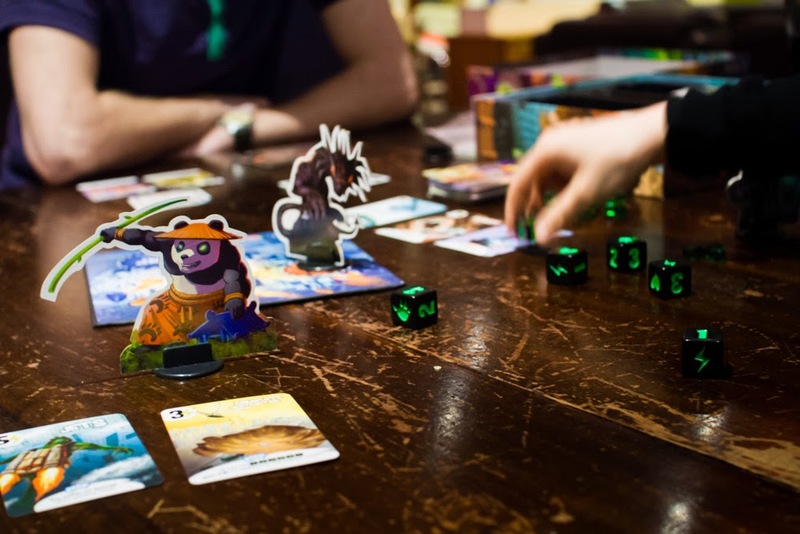 Some games of King of Tokyo end pretty quickly where as some take a while. This one was the latter. Matt however must have used all his board gaming skills on Ghost Stories because his monster was taken out in the first half the the game. I stormed ahead after a slow start using all my dice rolling skills (along with the Jets card, allowing me to take no damage when I yielded Tokyo) for a surprise win. Back to the normal 7:30 start next week, board game fans.